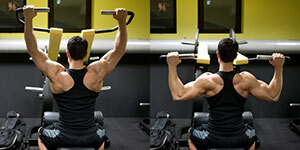 The pulldown on a lat pulldown machine is good variation of the regular cable pulldown. It turns of the need stabilizing muscles and you work primary your lats. So the best way to use this exercise is in the end of your back workout when your stabilizing muscles are tired and you can’t control free weights safely. Set up for the exercise as you put the desired weight on the machine than grasp the handles with wide overhand grip (palms facing forward) and sit down . Secure your knees under the pads to provide stable position during the movement. With fully extended hands slightly lean back, look toward the ceiling and puff out your chest. This is the starting position. Breathe in and start to pull the weight down toward your upper chest by first pulling with your shoulder blades and then with the arms. When the bar reach your upper chest hold the contraction for a second and return the weight back to the starting position in a controlled way as you breathe out. Keep your back arched, your head up and your chest puffed out to ensure maximum involvement of the back muscles. 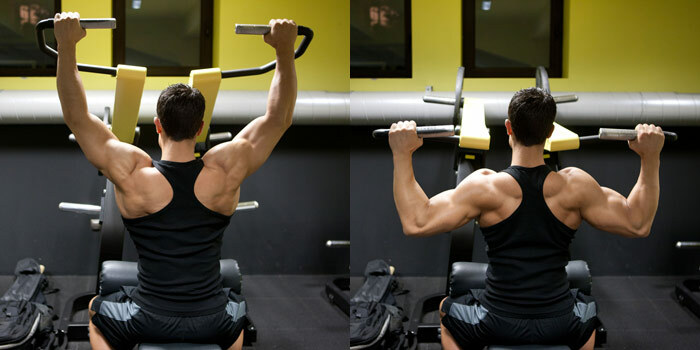 Use a hook grip (with your thumbs over the bar) and wrist straps to reduce the work of the forearms and avoid failure in them instead in the back muscles. Control the movement and keep your torso stationary let the lats do all the work not inertia and other muscles. Perform the negative phase of the movement for twice longer time than the positive.